Although the chronology of Torres-García's painted woods ranges from the beginning of the 1920s to the end of the 1930s, over three quarters of the works executed with this technique date from the years of his sojourn in Paris, that is, from 1927 to 1932, a period when the artist underwent an important evolution before attaining his artistic maturity. They are in fact experimental works, which the artist always kept in his possession for his own study. Black and White Structure belongs to a relatively small group of works made of wood panels on a base (a lath) and to some extent conceived as sculptures or three-dimensional objects, even if only one side is painted, which implies a frontal vision. There are two more wooden constructions dated in 1930 and with similar characteristics to the one we are analysing. One of them has not yet appeared in a publication and the other (entitled Construction with Man and Objects), was shown for the first time in the exhibition Torres-García held in Madrid and Valencia in 1991. Both are monochrome and have symbols inscribed; the second does not have a base lath and for this reason it can be considered to be incomplete. In my opinion, these are studies or preliminary works linked to Black and White Structure. In the three cases there is an asymmetrical form built with vertical rectangular blocks placed on a horizontal base, recalling an architectural construction. Although Black and White Structure slightly resembles the Manhattan cityscapes that the artist drew or painted during his first stay in New York in the early 1920s, the combination of asymmetry and stability which characterises it constitutes an important aesthetic discovery, which we will find again in later works; works which illustrate the notion of monumentality, one of the key concepts in Torres-García's poetics. Among them we should mention Object with Number 1, 1932 (included in the aforementioned Madrid and Valencia exhibitions as no. 67 in the catalogue), Black and White Shapes, of that same year (included in the exhibition Torres-García held in London in 1985, catalogue no. 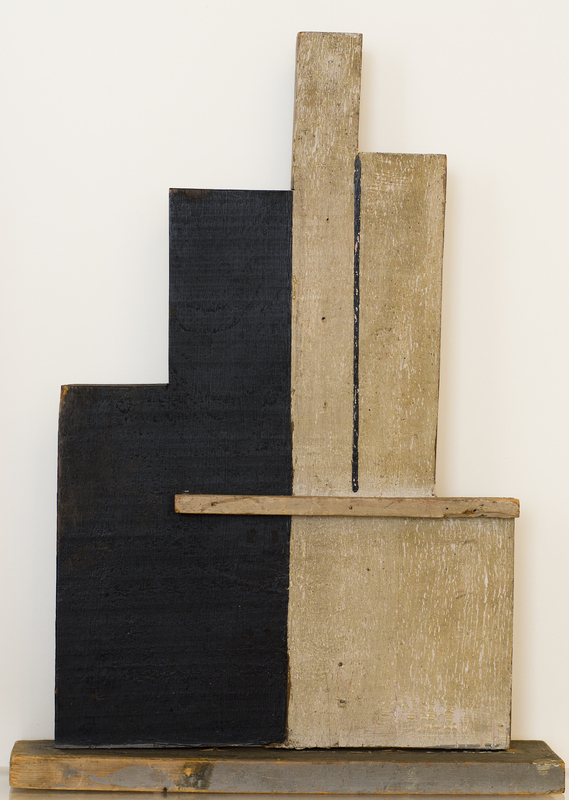 65), and Wooden composition, 1931-1934, one of the most famous wooden constructions of this artist, at present belonging to the IVAM collection.